Free water collects along the ground surface and lubricates the snowpack. The water can come from snowmelt or rainfall. As the water pools and reduces the friction holding the snowpack to the underlying surface. Wet snow is more viscous than dry snow, so a wet slab deforms and “flows” downhill easier. Glide is usually a slow process occurring over several days or weeks, but occasionally happens much faster. If the gliding snowpack breaks free of the surrounding snow it can avalanche. Glide cracks may open up in the snowpack, but do not necessarily indicate an avalanche is imminent. Glide Avalanches occur on smooth slopes. Grassy slopes, rock faces, and glacial ice or firn are common surfaces. The free water can spread evenly, and it is easy for the water to drown surface roughness. Very rough surfaces tend to channel water, rather than allowing it to spread out, and have very high friction. Glide cracks often form where the ground surface changes from rough to smooth, and on convex rolls with a smooth surface. 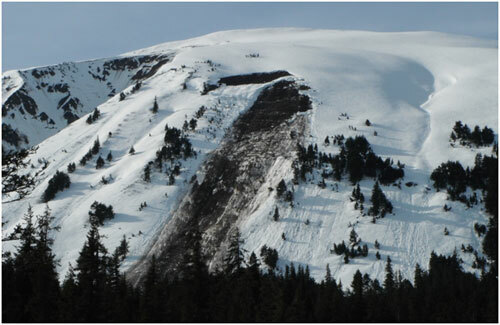 Glide Avalanches tend to happen on specific slopes. This Glide Avalanche broke to the ground on a smooth, grassy slope. From all the mud on the bed surface, water pooling at the base of the snowpack likely caused the failure. Glide Avalanches require free water in the snowpack. In a continental snowpack, most free water comes from melting in the spring. Glide Avalanches tend to be late spring events in Colorado. Glide Avalanche release is challenging to predict. Surface conditions are not a good indicator, because it can take hours or days for free water to run through the snowpack and pool on the ground. Several days of warm temperatures can make glide avalanches more likely, but the avalanches sometimes release after the temperatures cool, but free water continues to run through the snowpack. Glide cracks are an indication that glide avalanches are possible. The cracks point to slopes with sufficient smoothness. Because the gliding occurs at the ground surface, the rate is hard to observe. There is not a direct correlation between weather events and Glide Avalanches, so those factors are not useful predictors. Knowledge of the ground surface can be helpful. You can visit favorite areas in the summer and look for smooth grassy slopes and rock faces. Some of those slopes can be identified from air photos or satellite imagery.